Robo Knight at first appears in Troy's dream involving the previous Power Ranger teams fighting an unknown evil. It is later revealed that he was previously created by Gosei to serve as the protector of Earth and would emerge when the Earth is threatened. During his time in dormancy, Robo Knight lost some of his memories including the one where Gosei created him. When the Mutants emerge to pollute the planet, Robo Knight arrives up and helps the Megaforce Rangers fight Hisser. Afterwards, Robo Knight leaves them. Gosei tells the Rangers that Robo Knight has to re-learn his origin if he and the Rangers are to combat the threats to Earth. 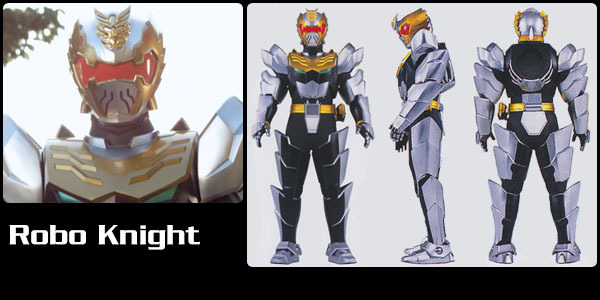 Robo Knight used to be very different from the Rangers. He fought without thinking about human sacrifices, and usually left the saving to the Mega Rangers. However, due to his convivence with human beings, he began to develop his own humanity and eventually decided to defend it due to guarding life being as important as protecting planet Earth itself. Robo Knight has the ability to turn into the Lion Zord. The Lion Zord can also combine with a dump truck to become the Lion MechaZord. Robo Knight also possesses the Sky Lion Zord and the Sea Lion Zord which can combine with the Lion MechaZord to form the Gosei Grand Megazord.